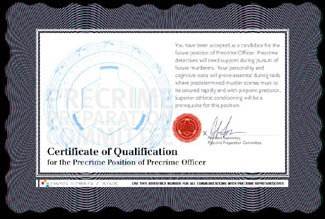 Precrime is a groundbreaking system that detects abhorrent acts against man that will be committed at some future date. Developed by a team of technologists and crime specialists, with the authority of the United States government, Precrime never fails. It uses a groundbreaking new technological capability called pre-visualization that enables police detectives to observe, substantiate, and halt crime before it occurs. Law enforcement agencies have often used "remote viewing" and other cognitive technologies to assist them in the apprehension of criminals and in the location of missing persons. The Precrime System will mark the very first time that these technologies have been meshed together in a crime prevention structure. The following are the Ten Most Wanted criminals on Precrime's list for June. Juwanna Mann is wanted for impersonating a woman and other horrific crimes against nature, most notably being the primary character in a movie that has all the potential for sucking a lot. Misogyny seems to abound in both the plot description and the trailer, so you militant feminists are likely to be very pleased that Ms. Mann's crimes are evident this far in advance. Even people who live in the most surreal of fantasy worlds are going to have trouble suspending disbelief enough to believe that a gold-toothed Tommy Davidson would seriously fall for a woman who looks like a cross between Jim Carrey's Vera de Milo and Jamie Foxx's Wanda, both of the Fox variety show In Living Color (I mean, seriously, Davidson was a regular cast member on that show so you'd, think he would have learned to tell the difference by now). With any luck, the charming Vivica A. Fox might just be able to save the film. Arnold is known to be a future environmental radical and has an appalling football-shaped head. Young Arnold will prove in his upcoming film Hey Arnold! The Movie that he is staunchly against big business as he tries to prevent kindly developer Mr. Scheck from building a wonderful mall-plex especially for the community. This NickToon is just further proof of the deep liberal influence in Hollywood and I, for one, am glad to see that their crimes will not go unpunished. It's a sad day for American capitalism when a man can't fly a midget from a kite over Central Park. Didn't Gaylord Oakes watch Undercover Brother? What the hell is he trying to do by sissifying Chris Rock in Bad Company? Apparently Rock's character, Jake Hayes, is too "streetwise" and therefore needs a makeover, Eliza Doolittle-style. Oakes is assigned to train him to become (and I'm quoting directly from the synopsis on the official site here) a "sophisticated and savvy spy." Perhaps the biggest crime is that two actors as eminently talented as Rock and Anthony Hopkins, who plays Oakes, signed on for this drivel in the first place (though honestly I don't know what else we would expect from a big-budget Joel Schumacher film). Maybe the film can redeem itself by offering up a potential drinking game: Spot the Cliché. Siddalee is an accessory to one of the most heinous of crimes: bringing an Oprah Book Club novel to the screen. Who was the Hollywood honcho that decided Golden Girls: The Movie was a good idea in the first place? Aimed solidly at the well-known, lucrative Fixodent demographic, the trailer for Divine Secrets of the Ya-Ya Sisterhood is so groan-inducing that not even Ashley Judd removing her clothes can save it. Sandra Bullock must have thoroughly pissed off her agent at some point after Miss Congeniality was a big success, since her two follow-ups were this film and the little-seen Murder by Numbers. The only remaining cast member I can actually name is James Garner, who is starting to settle comfortably into the old-codger role. If you want to see how irritating and cloying this film is likely to be, just go check out the Ya-Ya Name Generator. I get Countess Sparrow Hawk. Go Ya-Yas. Wanted for concealing a debilitating medical condition so that he can return to duty. Sergeant Enders is given the duty of being a bodyguard to a Navajo soldier, one of several code-keepers entrusted with a secret Navajo language code. Since the Japanese were unable to crack this code during WWII, a possible wartime scenario is that they would try to kidnap some of these soldiers to get answers. Enders' orders are to kill his charge if such an abduction becomes imminent. Directed by John Woo, Windtalkers finds itself in the unfortunate position of being the latest in a seeming influx of historical, war-themed movies in recent months, with Behind Enemy Lines, Black Hawk Down, Hart's War, and We Were Soldiers all finding varying degrees of success. The cinematography for this film appears to be gorgeous from what the trailer shows, but Nicholas Cage didn't exactly have an enormous amount of success with last year's war-themed flick, Captain Corelli's Mandolin. Unless the marketing gets dialed up substantially in the coming weeks, the outlook for Windtalkers isn't a strong one. Considered extremely dangerous, Bourne is a man on the run from the law and assassins for crimes too numerous to mention. He seems to be suffering from amnesia, but that's certainly no excuse for his past evils. Inexorably linked, thanks to their work together on numerous past projects, Matt Damon and Ben Affleck took on separate action projects that somehow managed to be released in the span of two weeks of one another. Affleck is experiencing an odd backlash from folks who suddenly despise him, but Damon seems to be largely unaffected by those same wagging tongues. Despite the anti-Ben sentiment, Affleck has been able to show a strong box-office presence with his last two projects, Changing Lanes and The Sum of All Fears, but Damon's top-line success at the box office has been a great deal more spotty. Though The Talented Mr. Ripley was a decent December hit, both The Legend of Bagger Vance and All the Pretty Horses can be considered nothing short of disappointments. Nonetheless, the trailer is hot and audiences who might be starved for some decent action after the dreadful preceding weekend offerings might find The Bourne Identity the perfect appetizer. This Scooby's crime is clear: Defiling the good name of a beloved Saturday-morning cartoon series. The general consensus is that this trailer is absolutely dismal and that the CGI Scooby-Doo is a disgrace. Add to this some awful casting with Freddy Prinze, Jr. and Sarah Michelle Gellar as Freddy and Daphne, and we have all the makings of an impending disaster. To its credit, Warner Bros. did a terrific job with marketing the garbage they're trying to pass off as wholesome family fun. The initial "Batman" teaser was adorable, and the current ads being run during children's television shows wisely focus on the sweet relationship between Shaggy and Scooby, not to mention Matthew Lillard's dead-on personification of Shaggy. Also, Linda Cardellini is a terrific young actress, and if taking on the part of Velma for this film opens some doors for her, so be it. Fortunately for WB, this franchise has a huge and voracious following, and quality isn't even going to be an issue here. Much like Scooby, Mr. Deeds' biggest crime is his contribution to the sullying of the good name of the 1936 Gary Cooper classic Mr. Deeds Goes to Town. When you think of remakes of time-tested films, the first name you think of is Adam Sandler, right? You'd better hope so, because he's the star of this "re-imagining" of the timeless tale. There looks to be a lot of gross-out humor, as is typical for Sandler films, but fortunately, the audiences who remember the early flick fondly will have those damned Ya-Yas to keep them preoccupied. Honestly, I'm a Sandler fan and I think this film looks like a lot of fun. The mocking of Winona Ryder is hilarious, and all incarnations of the trailer have made me laugh. After the disappointing box-office performance of Little Nicky, this Mr. Deeds has all the earmarks of a being a solid winner for Sandler. A most notorious extra-terrestrial fugitive, Stitch is just bad news. As you can see from his teaser trailers, he's perfectly willing to ruin some of Disney's most beloved classics...Beauty and the Beast, Aladdin, and even The Lion King. The little blue creature is an unknown species who has escaped from the interstellar custody of Prison Transport Durgon, and you'd better believe they're seriously searching for him. He is absolutely brilliant, using 90% of his brain for higher functions (as opposed to humans, who use only a small percentage of their brains at any given time). This beast is considered four-armed and dangerous. Disney has mounted a wonderful marketing campaign for what looks to be a terrific concept. Early reviews are quite positive and audience reactions to the teasers and trailer have been nothing short of phenomenal. Given the strong thirst for family entertainment, Lilo and Stitch looks like a huge winner and should be one of the top films of the summer, if not the entire year. As you have probably gathered from commercials and trailers, Chief Anderton is accused of future murder. A stolid follower of the Precrime system before the tables are turned on him, he is now on the run from the law and must be stopped at all costs. As far as the box office prospects of Minority Report, it's really quite simple. Summer + Tom Cruise + Steven Spielberg + those nifty spider thingies=$$$$$$.